Home / Unlabelled / THE LEVELS OF PRAYER - WHAT LEVEL ARE YOU AT? The first is the level of the one who wrongs himself and is negligent. He does not do the wudhu (ablution) properly, or pray at the right time or make sure he does all the necessary parts of prayer. The second is one who observes the outward essentials of prayer, prays on time and does wudhu, but he has lost the battle against his own self and is overwhelmed with wasawis (insinuations). The third is one who observes the outward essentials of prayer, prays on time and does wudhu, and also strives against his own self and against wasawis, but he is preoccupied with his struggle against his enemy (i.e. 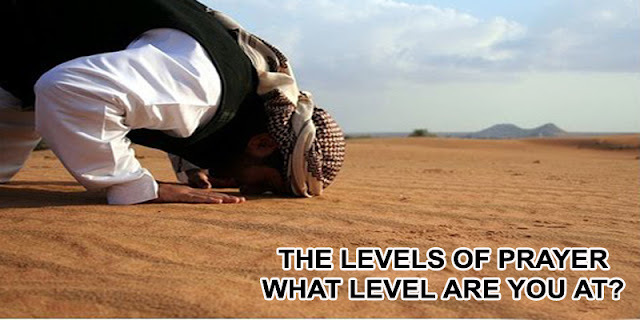 the Shaytaan), lest he steal from his prayer, so he is engaged in salaah and jihaad (struggle) at the same time. The fourth is one who when he stands up to pray, he fulfills all the requirements of the prayer, and his heart is fully focused and alert lest he omit anything, and his concern is to do the prayer properly and perfectly. His heart is deeply immersed in his prayer and worship of his Lord. The fifth is one who does all of that, but he takes his heart and places it before his Lord, looking at his Lord with his heart and focusing on Him, filled with love and adoration, as if he is actually seeing Him. That waswaas and those thoughts diminish, and the barriers between him and his Lord are lifted. The difference between the prayer of this person and the prayer of anyone is else is greater than the difference between heaven and earth. When this person prays, he is preoccupied with his Lord and content with Him. 1) The first type is punishable. 2) The second is accountable. 3) The third is striving so he is not counted as a sinner. 4) The fourth is rewarded. 5) The fifth is drawn close to his Lord, because he is one of those for whom prayer is a source of joy. Whoever finds their joy in prayer in this life, will find their joy in being close to Allah in the Hereafter, and will also find his joy in Allah in this world. Whoever finds his joy in Allah will be content with everything, and whoever does not find his joy in Allah, will be destroyed by his feelings of grief and regret for worldly matters.